I’m starting my week with Fisher’s recipe for those truly desperate, hungry, and broke: Sludge. “How to Keep Alive” is the chapter title, and it begins “There are times when helpful hints about turning off the gas when not in use are foolish, because the gas has been turned off permanently, or until you can pay the bill. Let us take for granted that the situation, while uncomfortable, is definitely impermanent and can be coped with. The first thing to do, if you have absolutely no money, is to borrow some…As soon as you have procured fifty cents, find some kind soul who will let you use a stove…buy about fifteen cents’ worth ground beef from a reputable butcher…about ten cents’ worth of whole grain cereal…(and) spend the rest of your money on vegetables. Get one bunch of carrots, two onions, some celery, and either a small head of cabbage or the coarse outer leaves from some heads that should be trimmed a bit anyway. It does not matter if they be slightly battered: you will wash them and grind them into an odorous but unrecognizable sludge. Fisher recommends any remaining money be spent on additional vegetables, like squash and zucchini. This recipe, she says, will feed you for about four days once cooked into Sludge; I scaled down the proportions for one day’s worth. I sweated the onions, carrot, and celery in a little bit of oil, over medium heat for about five minutes. I seasoned with salt and pepper, then tossed in the meat, breaking it up with a spoon, until it browned: about seven minutes more. 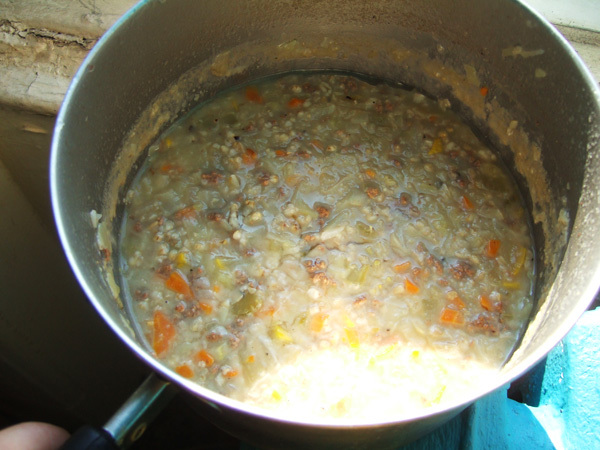 I added the cabbage and squash, and covered it all with what looked like “too much water.” I turned up the heat, brought it to a boil, then turned the heat down to low to let it simmer. I let it cook, covered, for 30 minutes on low. It looked like a sad soup, but it smelled fairly magnificent. After thirty minutes had passed, I added 1/2 cup of steel cut oats. I left the temperature on low, and let it simmer uncovered for an hour. When it was done it looked, and smelled, like a very thick chicken and rice soup. At this point, Fisher recommends grinding the entirety of the dish in a food mill; I decided in advance to skip this step, and simpley dice all of the vegetables very fine. I let the sludge cool and stuck it in the refrigerator to await my breakfast. I have to admit I wasn’t excited to get up today and try a bowl of sludge. When I pulled it out of the fridge, I was shocked to discover it had formed into a nearly solid mass. I scooped out a cupful and microwaved it. I have to say, it’s not bad. I added a little extra salt, and it tastes pretty much like a bland chicken soup. I sincerely enjoyed the texture of the steel cut oats they were a little more firm than rice, which tends to get too squishy when left in a soup overnight. Sludge is cheap as hell to make, and there’s a lot of healthy stuff in there: protein, whole grains, veggies. And it is really filling. I ate it three times today without complaint. I made a similar soup last weekend in a slow cooker. I chopped up a little less than a pound of horridly tough beef, a few carrots, a sad looking onion, a few mushrooms, and 3/4 cup pearled barley. The smaller you chop the meat and veggies the better. It’s a good way to clean out the fridge if your veggies are starting to look wilted or shriveled. I can’t say I would be willing to eat it for all three meals, though. It’s amazing how cheaply you can feed a college student or a whole family on soup or stews, and you can buy a slow cooker very cheaply. Chop everything the night before & toss it in the pot before you go to work. A little Tobasco to taste doesn’t hurt, either. I live by my slow cooker in the winter time; it is cheap, and a better alternative to filling up on cheap carbs. Fisher even talks about “the fat look of starving families” (paraphrased) which is something in the news a lot today; families in low income areas are also obese. This is a great way to use up sad looking veg; would i make it regularly? probably not. Would I make it in a bind? Definitely. I read How to Cook a Wolf several years ago and you’ve got me planning to head over to the public library today to check it out and read it again – but I don’t think I’ll be making Sludge for dinner. …and people complain that nutraloaf is cruel and unusual. Clearly, it isn’t unusual. Perhaps they mis-typed “gruel…”. Thanks for this week. Give it up for MFK! It’s not so bad at all! Start with a mirepoix and then just start adding things you find to be tasty. It’s hard to go wrong. I used to make it fairly regularly when I was working on tugboats and we hadn’t taken on supplies in a while. It is remarkably similar to scrapple, or a reinforced polenta; being as river tugs are primarily Southern in character, I called it a ‘hotrodded mush’ and the other deckhands totally got it. It was never refused and always finished. The wolf is at the door now. I think I’ll make a big batch.